Some product photos and description are from Eshiko. Smaller pores, smooth & glowing skin in just one application! ESHIKO™ is a transparent hydrated silica face powder reduced to a size of 10 nanometer, the size of a single particle of smoke. Due to its size, it easily glides to the skin leaving a layer of protective light absorbing nanospheres that makes the pores smaller and gives a smooth and radiant look in an instant. It is also translucent which means it does not make your skin pale white even after excessive application. ESHIKO™ absorbs oil and sweat 15 times its own weight. It's perfect for people who want to have the perfect skin complexion. The claim about divine poreless skin upon application made me buy Eshiko. Also, there are tons of positive reviews online! ...and who wouldn't be curious after seeing this photos? I was like "Oh it's magical!" 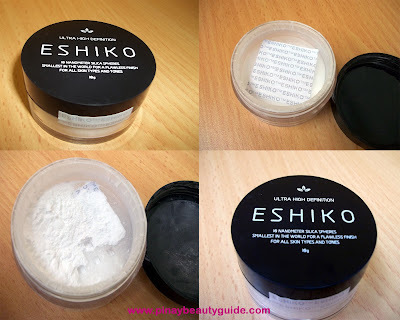 At first look Eshiko looks like a simple tub of powder, who would imagine that it costs a lot? It has a protective tape inside to avoid product spillage however there are still powder particles in my package when it arrived, which means that despite the tapes still didn't secure the product inside. I just used a cotton pad to stop the powder from spilling especially when I bring the tub along in my kit. Packaging is sturdy but after a few weeks the 'Eshiko' brand name on top of my powder's lid faded. The white silica powder is finely milled I must believe that this is indeed the same size of a smoke particle. It is 10 grams per tub and looks like a decent finishing powder. First time to post a side by side photo!~ The side with Eshiko looked brighter right? But see how it highlighted dry patches. Can you see how it softens the look of the pores? I am mostly into glowing look nowadays this product makes me look matte but not flat. My face doesn't stay matte for long, I get oily after about 3 hours and I need to blot or at least reapply the product. IMO it does not look better with the presence of moisture and oil unlike mineral powders. 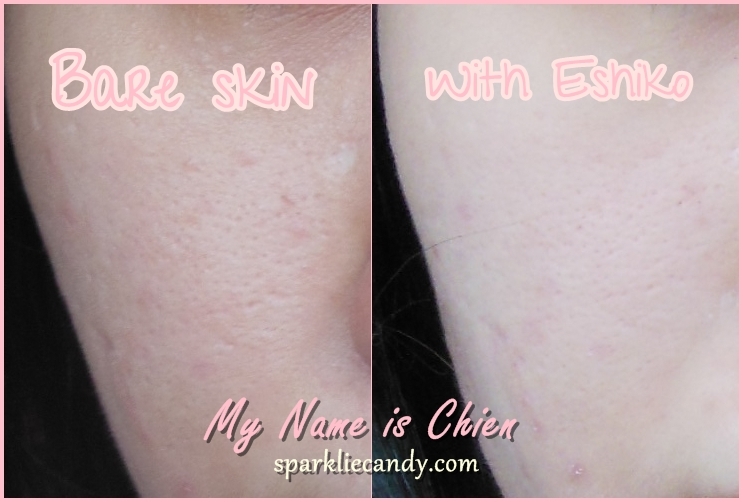 It can give a slight glowing and flawless look but it just won't do justice on pimple marks especially on red acnes. How about on pores? It does soften, yes it is the right word for the effect it does on pores. It doesn't blur nor minimize but it softens the look of the pores making it less visible or attention grabbing, I should say. It can also actually help in making us look great on photos but it doesn't look as awesome in real life. I don't know what to expect on a HD powder. It quite rough for my skin upon application, nothing to be surprised about because the product is silica however I am not comfortable using it. I already turned my back on Ellana's White Chocolate powder primer which is also made of silica. I use either of my my kabuki brush and sponge for applying products. It depends on what I've grabbed that day, lol. I'm not choosy on those kind of stuff. A little actually goes a long way with Eshiko. They've only used Xend for shipping and I am in Manila but shipping fee was P160. I can't use it alone when I am not in my good-skin days. Good effect doesn't last long. No. I like Eshiko but I don't I'll need another one anytime soon. I think I can still find an affordable version of this powder in the market. The results it gave me is not as outstanding as it claims. Price is quite over my budget. A nice finishing powder but not-so-worth the price. I still have a lot of powders, cheaper ones that I like better than Eshiko, take Palgantong powder as an example. I can still recommend this if you have the budget, the good skin and if you are looking for a finishing powder bound to brighten up your skin. No make-up look with bb cream, Eshiko, eye liner and peachy lippie!